The large canvases are wrapped in sheets and plastic and stacked with even larger pieces of cardboard lying in between. 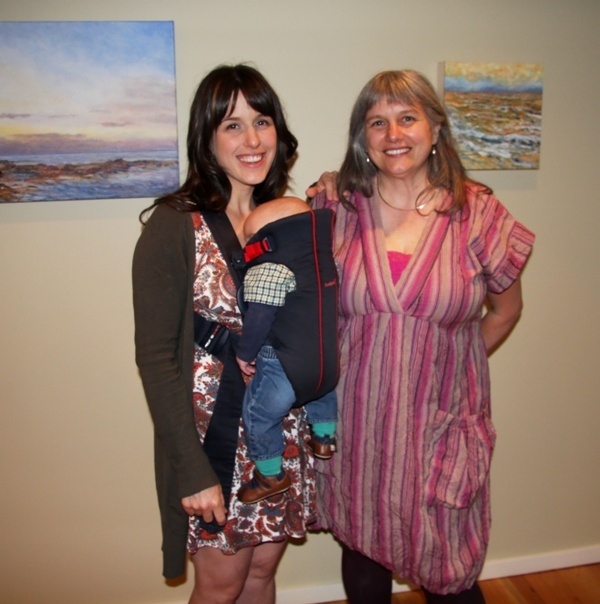 We ceremonially carry each painting and place them into the back of my rather tired old ford pick up. The plywood dry box is already carefully stuffed with smaller canvas oil paintings. Now ready to drive the short distance to the exhibition venue I realize Miss Prissy’s cargo is worth many times more than she. But as usual, she doesn’t seem to mind. I am sure there isn’t a snobbish piece of metal in her paint-chipped body. Tomorrow, STUDY of BLUE will open. 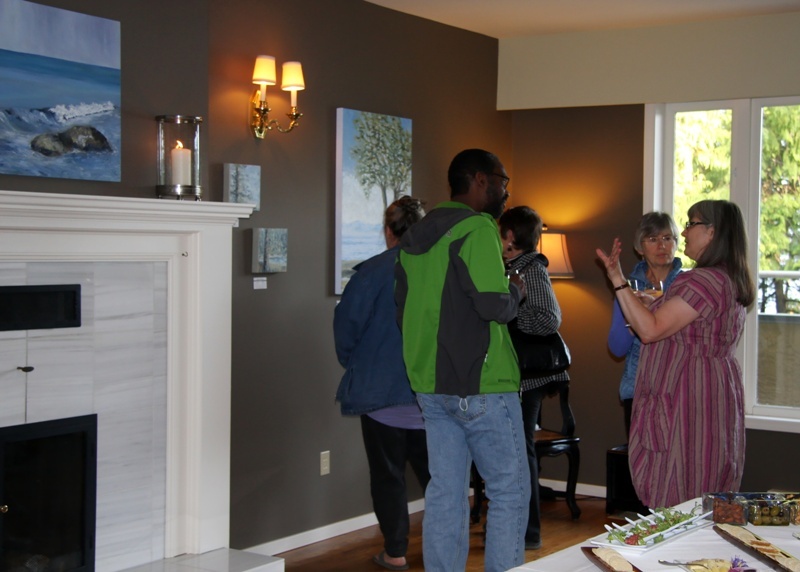 The Oceanwood Restaurant and Inn has done a fantastic job of creating gallery space. We take our time, deciding on the best location for each piece of work. The next evening, with toes sparkling new polish, finger nails buffed and decked out in a very fun balloon dress I open the show. I handed my camera to my daughter Josie who did her best to capture the evening. However, she said people kept looking like deer in the headlights so she stopped taking photos after a while. We do have a few though. 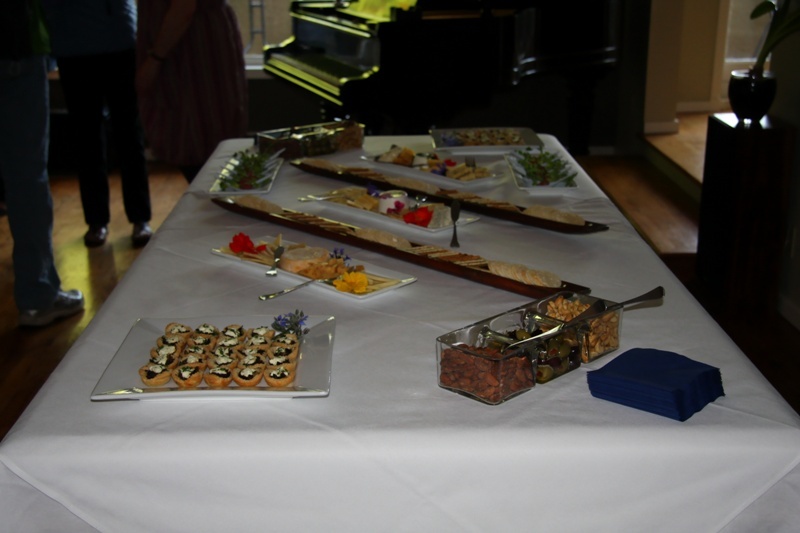 The food was extra delicious, delicately flavoured and served with elegance. 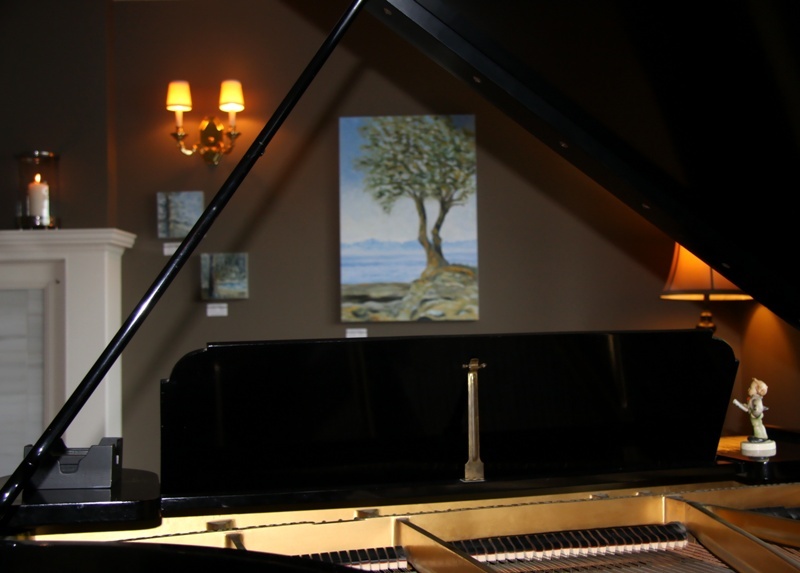 And there is nothing quite like seeing a painting through a grand piano. My favourite comment of the evening was from a long-time resident who came by near the end of the evening to thank me for putting on the exhibition. I don’t think there was ever any doubt but it was a pleasure to be a spark for such sentiments. I would like to thank the Oceanwood Restaurant and Inn because they are ultimately responsible for orchestrating such a classy event which then garnered this comment. At the end of the evening FIR TREE SKY sold to a lovely couple from Michigan, bringing the total sales so far for this exhibition to four original oil paintings. Considering our economic climate, I am pleased with these early results. What is next? 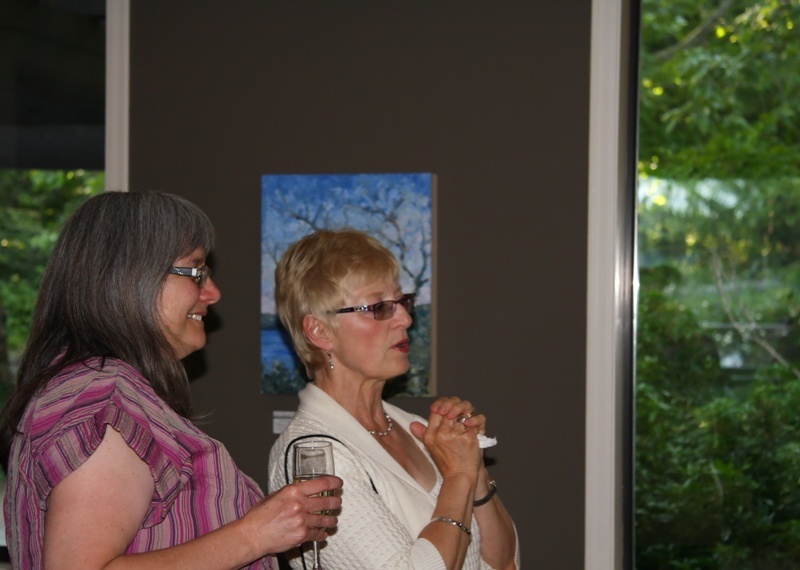 I have an offer to show at a venue on Salt Spring Island. I have an invitation to hang a piece or two in another local venue. 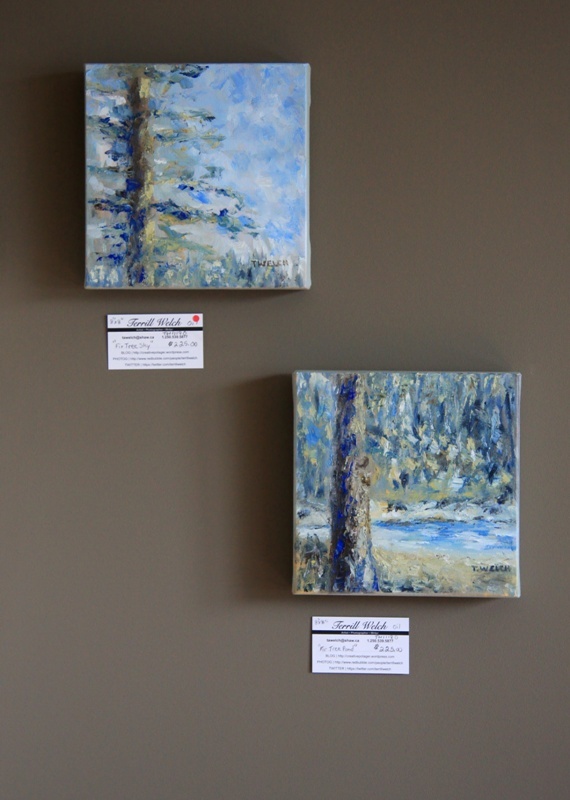 There is a restaurant in Vancouver that is accepting original art work. I have also been asked to provide a cover image and feature interview for a regional magazine’s September issue. But I am wondering, is it time to seek gallery representation? If so, where might be a good place to start? 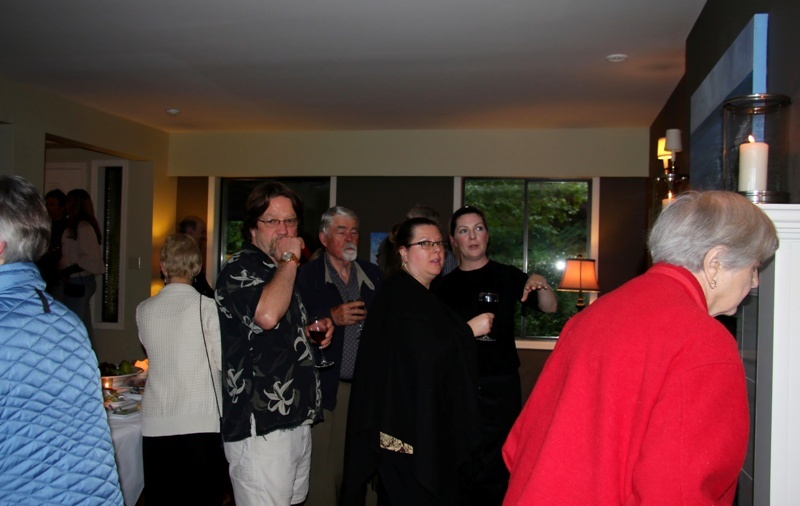 Or do put my focus into building my direct relationships with buyers? Or is it both? Possibly both but I am still thinking. While I think I shall paint. Thank you for your special part in the STUDY of BLUE journey with me here on Creative Potager, and on twitter and facebook. Sprout question: What is creatively next for you? 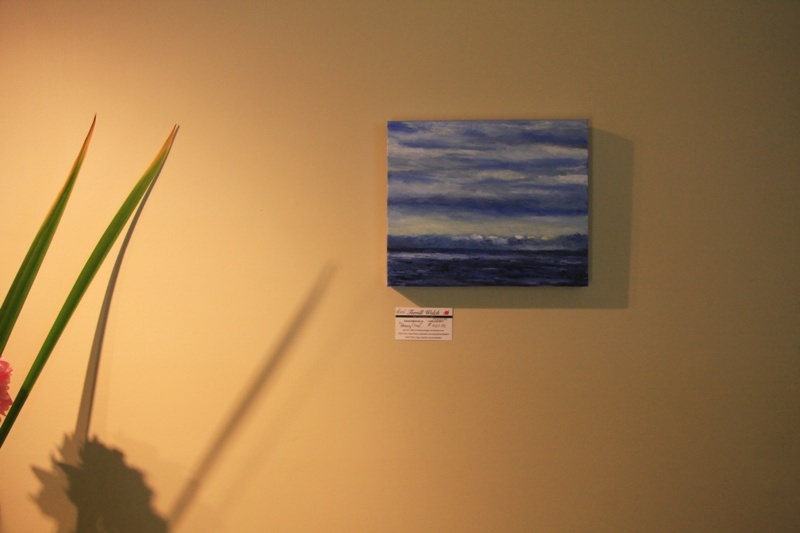 STUDY OF BLUE solo exhibition is up until July 27, 2011. Your work looks really beautiful in that space. Congratulations! Thanks Maureen. 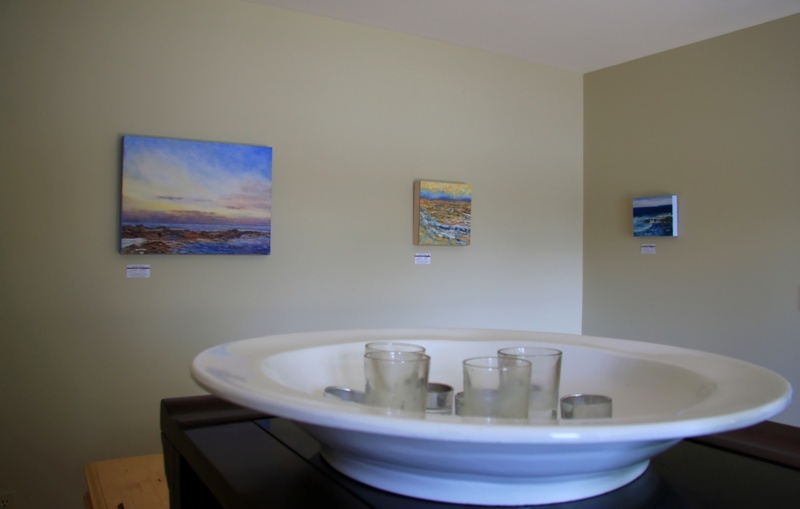 It was great fun to see all fifteen paintings hung as I do not have the wall space to do that in my studio or our home. I am so glad you were able to drop by. 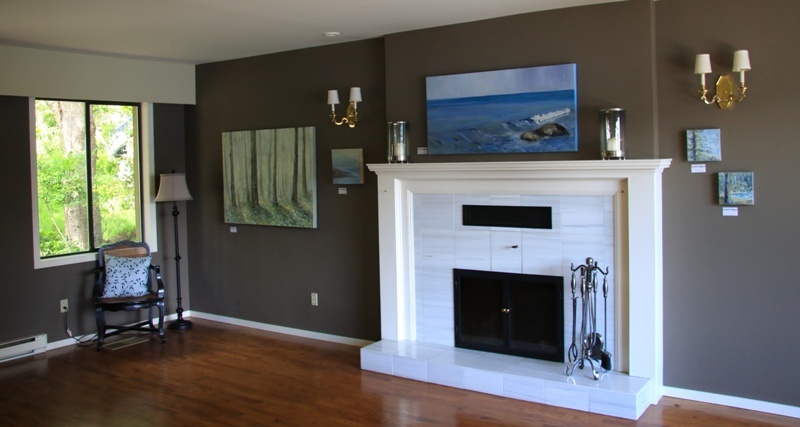 Thank you Michelle and is that a new painting I see on your home page? Thanks Sue. You would have enjoyed seeing peoples reactions and getting a sense of scale for the work. It is one thing to show a photograph and it is quite another to place a painting within an environment. Really appreciate you taking time out to drop in. A day or two of rest Patrica seems like a perfect plan after company. I sometimes feel like a slug after company leaves or I have been away and return home. But if I honour that need for sleeping and reading usually by day two I am ready to go again and quickly catch up. If I don’t, it can take a week to get my head of steam up again. “While I think I shall paint.” That’s because you’re one smart cookie, Terrill. The venue looks superb, like a setting for a gorgeous gem. I’m sorry I’m late, but if you head over to Speaking from the Heart, you’ll see why. Laurie I was just over to your blog and caught up on your recent storm experience. Holy crap! (profound use of the English language is warranted) Glad your own damage from falling trees was limited to branches. I know how much you love trees. I can see this will be heartbreaking for you. I have a photo of a grand alder that I will post today just for you and your community to help sustain your resilience. 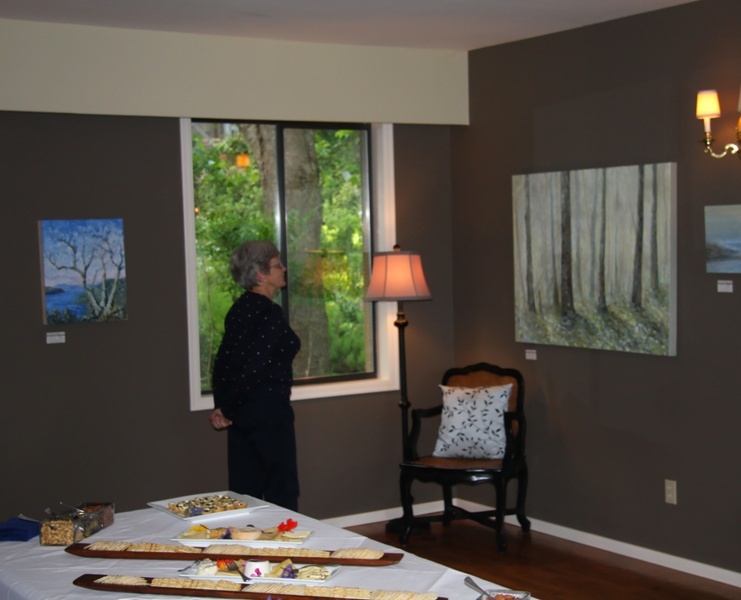 I am so thrilled to be a witness to your exhibit, even from afar ! Congratulations! This venue is wondrous space, looks like you had a great turn out! Your future looks bright! Congratulations again! Thank you Jeff 🙂 I wish all events and artist work was so well received. But for many reasons this is not always the case. We do our work and put it out there and it is good to remember not to be attached to the success or failure of any given show. It is what it is – nothing more and nothing less. I remind myself when I start to fuss about showing and the usual self doubts that our most internationally loved painter, Van Gogh, only sold one painting while he was alive. One. Today, he is the painter the world holds in greatest regard. Even though he took his own life at the age of 37 years of age he had already created a huge body of work and his brother had a well established art gallery in which his paintings were shown. Just one sold. I remind myself of this because once I do my best and paint what must be painted and photograph the image that is there to be taken and once I have sent it out into the world as best I can…. then my job is done. I must return to the work at hand – painting and photographing because success is a nebulous and often fleeting experience. The ongoing sustaining joy comes from sharing my work with other creative beings like you and others who simple appreciate the work for how it connects to them in their lives. Most often it is more than enough to simply be with a piece and know that I have captured a small piece of what is important to me.